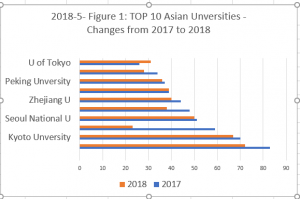 Who is number one in Asia – Tsinghua University or University of Tokyo? What Asian country debuted in a world ranking this year? This News Flash reviews two world rankings. NTU-TW uses only bibliometrics, favors large universities and receives little media attention. Times Higher Education uses a variety of metrics, has a slate of rankings released throughout the year and attracts worldwide media attention. We introduced the NTU – Taiwan ”Performance Ranking of Scientific Papers for Universities” in Ruth’s Rankings 6 and revisited it in October 2016 and October 2017 News Flashes. NTU released the 2018 rankings in early September, more than a month earlier than in previous years. It has a new interface but uses the same Clarivate Analytics’ metrics. See Example one, an added visual that compares two universities across the eight metrics. There is a revised way to count institutions’ publications. Universities have been separated from university systems, lowering their article counts. WOS often counts different universities’ schools separately and NTU has brought them together, increasing publications. The top 500 receive individual scores and rankings. The next 300 are placed in groups of 50 each. An additional 37 are only ranked in a subject area. Included are Chiang Mai University in the top 500 in Agricultural Sciences and Singapore Management University, in the top 300 of Social Sciences. 13 East Asian universities are in top 100. China has eight with two each from Japan and Singapore and one from South Korea. Australia adds five to the regional top 100 list. See Table 1 for the top 10 universities in the world and East Asia. China leads the region with 93 universities. The U.S. leads the world with 194 universities and 135 in the top 500. See Table 2 for number of institutions by Asia/Pac country. Because of the emphasis on quantity and eleven years coverage, changes, especially for western universities, are slow. Figure 1 shows changes in the Asian top 10 between 2017 and 2018. The universities are the same, their world rankings have changed, with the University of Tokyo dropping and the University of the Chinese Academy of Sciences roaring ahead. CAS joined the rankings in 2015 at 109 in the world and it is now ranked 23! [Note: many rankings do not include CAS because it only teaches graduate students]. NTU rankings include six fields and 14 subjects. Emphasis is on engineering which showcases Asian universities. For comparison, Harvard University is ranked first in the world and first in three fields and one subject area. Tsinghua University is 28th in the world, first in the Engineering field and first in four subjects, second in three and in the top 10 in one more. In analyzing the results from the NTU ranking, remember the methodology is based on quantity. NTU rankings are useful for research intensive universities, especially those who do not have access to Clarivate Analytics data. THE Young University, Reputation and International student rankings, with Hong Kong University of Science and Technology (HKUST) the number one young university in the world; Harvard ranked number one in reputation and Tokyo, at 13 the tops in Asia; and the American University of Sharjah (UAE) has highest percent of international students and University of Hong Kong at 22 in the world, the top in East Asia. Reputation factored into both the Teaching and Research pillars for the world rankings and percent of international students is a factor in International Outlook. Times Higher Education distributed its 2019 methodology the first week in September and kept us waiting until the end of September for their new rankings. There is no change in Elsevier as the data source or the methodology. Read more analysis on the rankings from THE’s Ellie Bothwell. 12 East Asian universities are in the top 100 with three from China and Hong Kong and two from Singapore and South Korea. Australia has six. The same universities continue to be at the top, although order changes. Tsinghua replaced NUS as number one. And HKUST, the world’s top young university dropped in the rankings. See Table 3 for world and Asian ranking. The 2019 rankings include 1,258 universities from 86 countries. This is an increase from 400 universities and 70 countries in 2015. 17 are from Asia/Pac. Nepal is a new addition and Bangladesh dropped out. Japan leads the region with 103 universities. The United States leads the world with 172 and 48% of the top 50. See Table 4 for country distribution. Table 5 compares the September 2018 NTU and THE rankings. The dates given the rankings differ. For bibliometrics, THE uses Scopus publications from 2013-2017 and citations from 2013 to the present. NTU methodology includes bibliometrics for an 11-year period, 2007-2017. University size is reflected in the much lower rankings for Hong Kong universities and Cal Tech and Princeton in NTU who are 5 and 17 for average number of citations per paper. While we may be bored by the lack of movement at the top, large annual changes would reflex on the reliability of the methodology. There is one more ranking to go, U S News Global which will be released at the end of October. This entry was posted in Asia Pacific, University Rankings and tagged National Taiwan University, NTU, Ruth Pagell, THE Rankings, Times Higher Education on September 28, 2018 by admin.